← Omaha, Nebraska. March 18th, 2011. Crews are working to fix a large sinkhole that opened up Saturday night in Claiborne County. The the hole is 9 by 9 feet wide and 10 feet deep. It opened in the northbound lane of Highway 25 E two miles outside of Tazwell. One northbound lane is closed, traffic is being directed around it. TDOT is working on the scene. They do not know when the road will be fixed. 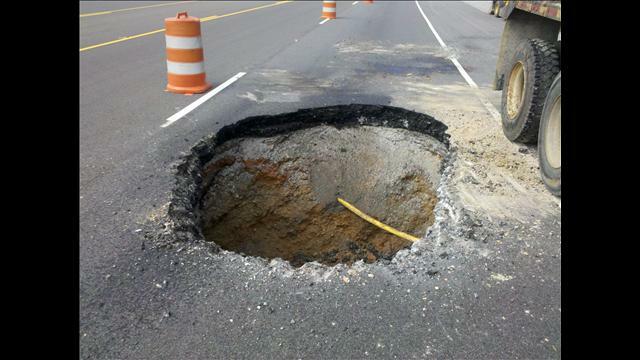 This entry was posted in Pictures and tagged Clairborne County, sinkhole, Sudbury, Tennesee. Bookmark the permalink.